Trick or Treat! Could this fun, funky, and freaky chicken—with its wind-blown feathers—really exist? Or is this a just photoshop job? Well, we’re not playing tricks on you! 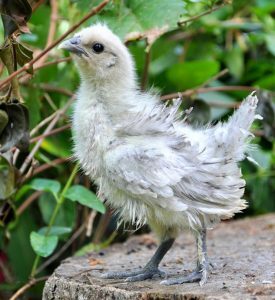 This Frizzle is a real treat, a true (and absolutely adorable) type of bird we offer here at My Pet Chicken. Chickendom has moved beyond just run-of-the-mill chickens, anymore! 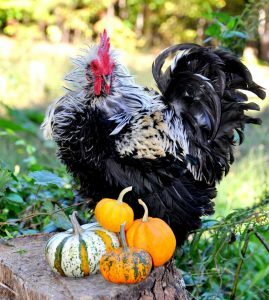 Now you can get truly freaky chickens to wow your neighbors with what pecks and scratches its way out of your backyard coop. 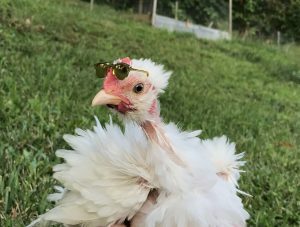 Let’s take a look at some of the more unusual traits chickens can have—the kind that might make your neighbors do a double-take when they see your freaky chickens! 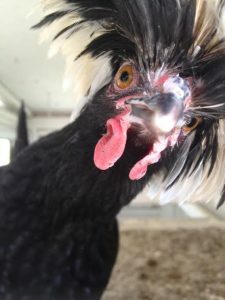 Some freaky chickens have a showy crest of feathers like a top hat or mohawk on top of their heads! However, others have smaller top knots that are more subtle. Silkies, Polish and Cream Legbars all have crests of various sorts. 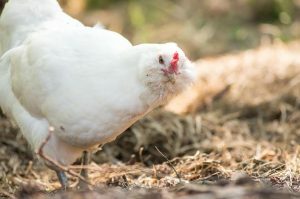 Some birds, such as Easter Eggers, and Ameraucanas, have fluffy cheeks that meet under their beak for a full coverage beard—for both hens and roosters. Frizzled chickens have distinctly curled plumage. Did someone put curlers on that chicken? Of course not. 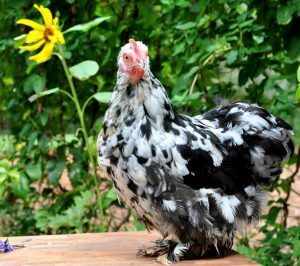 IN fact, frizzled feathers occur in many chicken breeds, such as Serama bantams. Freaky chicken: Frizzled with beautiful curls! Silkie-feathered chickens have soft, fluffy fur-like plumage. 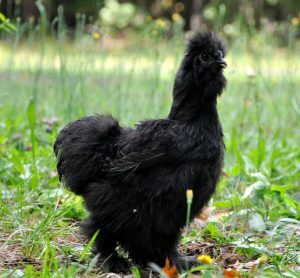 Those genetics can be bred into mixed breed birds, but of course the Silkie Breed is the prime example of silkied-feathering. This type of soft feathering with a distinct curl combines silkied and frizzled feathers. Sizzles can sometimes be found in our Fun & Funky assortment packs. Feather-foot chickens have feathers that grow on their legs and feet, in addition to their bodies. They sometimes look as if they’re wearing bloomers, for example Cochins or Brahmas. Bow-tie chickens have naked necks, but with one tuft of feathers centrally located on the neck imitating a bow tie. Then there are Silkie chickens with bow-tie feathering, which are often called “Showgirls” (including the roosters). The little hen pictured below came from Fun and Funky Hatching Eggs. Look at that little collar of a bow tie. Most breeds have natural pink or yellow tone skin. However, there are a handful of special breeds that carry this gene for hyperpigmentation,. They not only have black skin, but even black combs and wattles, and black beaks! Freaky chicken: Svart Hona, black from tip to tail. 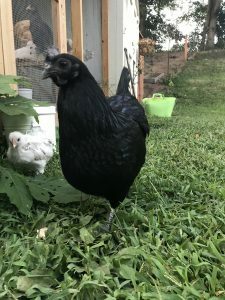 There are many more freaky chickens out there—chickens so unique in appearance that people who don’t know much about chickens may wonder what sort of exotic bird you’ve trained up as a pet! 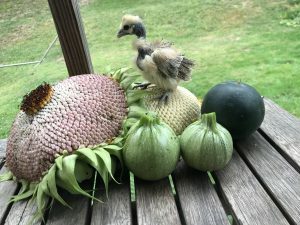 Do you keep any freaky chickens? What is your favorite type? I really enjoyed the pics. We are just learning about Buff Orpingtons.